When you’re a student, the return to school in the fall is always a bit of a letdown after the glorious freedom of summer. I remember that part of me was happy to see my teachers and get a chance to play with friends every day, but only part of me. Plus, there was usually the dreaded "what I did on summer vacation" assignment that always felt like a weird competition and an invitation to try to one-up your classmates. 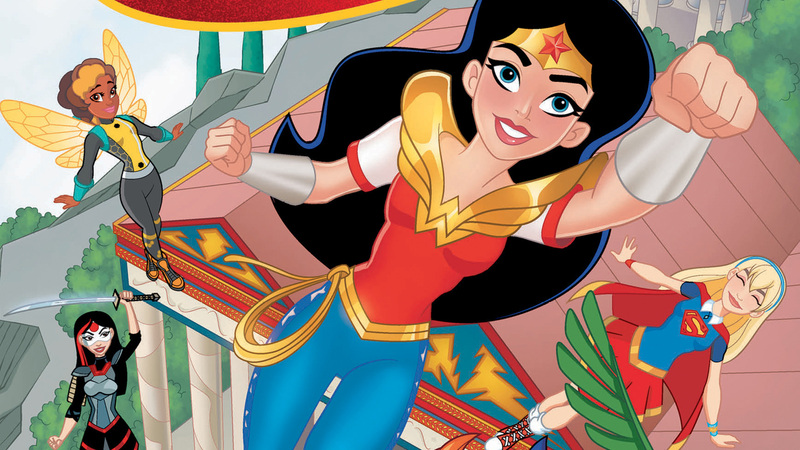 Wonder Woman had quite the essay to write after the adventures she had with her friends in the recently released DC SUPER HERO GIRLS: SUMMER OLYMPUS by writer Shea Fontana and artist Yancey Labat. In Summer Olympus, Diana's trip to spend time with her family at Mount Olympus during her summer vacation took a dramatic turn when Ares teamed up with Strife to cause trouble. He's the god of war, so it's not terribly surprising to find him plotting some nefarious deed. I was surprised his siblings and his father Zeus didn't have a closer eye on him—though maybe they will now. Ares and Strife used their combined powers to control the actions of the gods and goddesses on Olympus and to pit humans in Metropolis against each other. They influenced the hearts and minds of those around them with ill will. When they united, they caused chaos and trouble without any real direction. They took over Metropolis for the sake of taking over. But when Wonder Woman, Bumblebee, Batgirl and the rest of the Super Hero High students came together, they had a larger impact. Friendship won the day. Friendship can save the world. It's a message that resonates regardless of age—whether your friendships are developed through texts and recess or through lunch breaks at the office. You can make a strong stand alone, but you can do much more with loyal pals at your side. Of course, it helps if said pals have special abilities. It seems like everyone returned to Metropolis to help stop Ares and Strife, and each of them played a valuable part. Hawkgirl's archeology know-how meant she researched the Shield of Ares and learned information key to defeating him. Star Sapphire and Green Lantern used their powers to contain the gods and goddesses who were put under an evil spell. Katana, Beast Boy, Supergirl and more Super Hero High enrollees threw down to protect the city. With so many skills at play, the battles were splashy and dynamic. It's enjoyable to sit back and watch how the teens use their abilities—as is usual with DC Super Hero Girls. But fisticuffs weren't the solution this time, as they only made Ares more powerful. Being the god of war and all, he was fueled by the anger the heroes directed his way. Wonder Woman used the Lasso of Truth on herself and declared her feelings for her friends to Ares. She talked about what they meant to her and how they'd helped her. Being confronted with emotions and this outburst of positive comments about others was more than Ares could stand. He literally shrank away from Diana's praise for others. Ares was beat by kindness. After reading DC Super Hero Girls: Summer Olympus, I'm inspired to tell my friends why they're the bee's knees and how much I appreciate them. I don't want to wait until I'm confronted by Ares to let them know I treasure them. The god of war might not exist in the same form in our world, but figuratively speaking, he can be found. What did you think of Summer Olympus? Do you feel compelled to text your friends with warm and fuzzy thoughts? Let me know in the comments.